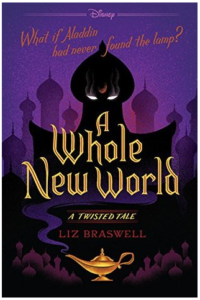 This weekend I finished up with a few books, one of them being A Whole New World by Liz Braswell. This is the first book in the Disney Press Twisted Tales series. I would give this 3.5 stars as I definitely liked it but it didn’t really blow me away. The first part of the book is written exactly like the beginning of the movie, Aladdin – even some of the dialogue is exact. In this story however, Aladdin doesn’t awaken the genie, Jaraf does. The consequences of that, as you can imagine, are not good. The second half really picks up with Aladdin, Jasmine and friends teaming up to defeat Jafar and free Agrabah from his demonic rule (which includes an army of the dead). In parts it was a bit too simplistic for my tastes but there was a lot of action and overall it was a quick, fun read! The second book in the series is, Once Upon a Dream, which is a retelling of Sleeping Beauty – the tagline for this one is, “what if Sleeping Beauty never woke up?” I own this one as well so plan to read it in the Spring. I love retellings and these ones are interesting as they just change one of the details (albeit an important detail in each one) and go from there – it’s amazing how much one action or decision can change a whole sequence of events that follow it. Do you enjoy retellings? Which are your favorites?